Still my Favorite Zone: The Obelisk of Lost Souls #EQ2 – Nomadic Gamers, eh! Everyone has their favorite zone, for many different reasons. Mine hasn’t changed even after all these years. 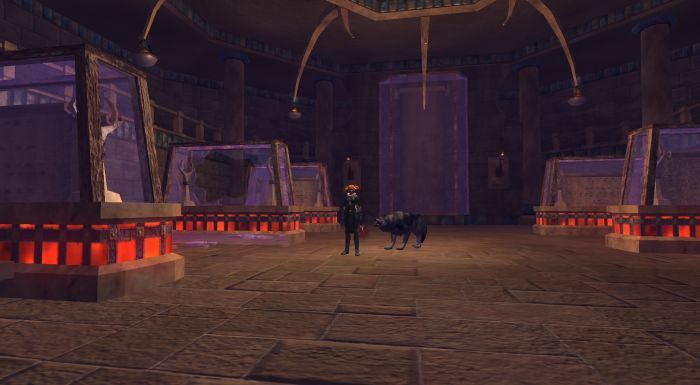 In EQ2 that zone is The Obelisk of Lost Souls. You can access this zone through a persistent door in the Feerrott or you can trigger the door in multiple zones such as the Commonlands. I noticed today that my quest journal was almost full (I only had room for two more quests) so I decided to work through the bundle that I’ve apparently stashed away and forgotten about. One of those bundles involved a lot of quests in my favorite zone – and what was even better is that they were quests for books, yay house items! So off I went. This zone tends to be pretty empty, has a lot of named, and it’s just so detailed and neat to run through. The books are also incredibly eerie and just plain creepy. Right now I’m working my way through Remembrances – Berrox, The Shadows of the Lonesome Hollow, Remembrances – DyzAz, Remembrances – Nyalla-Phon, and Remembrances – Prime. I’ll add those books to my Norrathian Museum, which is in a different house than my player-written books (not enough room to house both collections). The quests themselves are nothing to write home about. You kill 10 of a particular mob within the zone and then read the next page of the book. Rinse and repeat for 10 pages. Still, for some unexplainable reason this zone is just fascinating to me. It’s perfect for 35-50 or so, if you’re looking for a new place to explore that is a bit off of the regular trail, you should give it a try. It’s also great to mentor and explore.